Is your steering wheel vibrating more than usual? Is there a loud clicking sound that occurs when making a turn? These are some common signs that you may need to visit our auto repair shop for a CV joint replacement Clackamas community drivers can rely on. Our mechanics inspect and replace CV joints and shafts, and work quickly to diagnose any problems with CV axles and CV joints to get your car back on the road and driving like new. CV Joints Can't Be Repaired--Only Replaced. ACome to Steve's Imports for CV Joint For An Inspection Today! 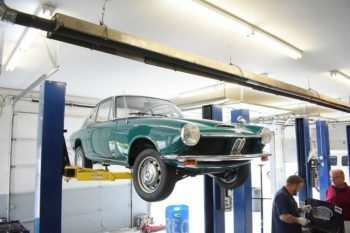 Our trusted mechanics have served Clackamas, Portland, and Gresham motorists for four decades. CV joint replacements cost less than you think, and they’re worth every penny down the road. Driving on a damaged CV joint will only get you so far, since a broken CV shaft only last so many miles before failing completely and potentially causing a catastrophic accident. When a CV joint fails, the axle can break, which can turn your car into a lemon. Depending on the extent of the CV joint’s damage, we have a variety of fixes for your car. Growling or vibrating sounds and a knock at low speeds. Your CV Joints require thick grease to protect from wearing down and overheating. When grease escapes the CV joint or boot, this is a sign that the seals are worn. Power goes is transferred from the engine to the driveline, which connects to the axle. The CV joints’ role is to connect the axle with the tires. When to the joint is damaged, the power transfer is reduced, which causes poor acceleration performance. When you have a compromised CV Joint, it won’t lubricate like it should. This allows heat to build up and can warp the joint or axle. That typically results in an audible noise, and if your vehicle won’t move at all but will rev, the universal joint may have snapped. 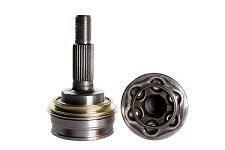 Damage: Warped or worn-out CV joints not transferring power to the axle. Our Fix: Complete removal and replacement of the CV joint, and possibly the axle. Damage: Broken axle due to bad CV joint. You’re car won’t go anywhere when this happens, and proves to be a major safety hazard. Our Fix: Replacing CV joints and axle to get you back on the road and driving safely.